The prestigious Kuwait University hosted the 4th International Conference on Social Sciences from 29th “”…” 30th November under the patronage of Prof. Moudhi Abdul Aziz Al Humoud, Minister of Education and Higher Education of Kuwait and President of the Kuwait University. As part of the conference, over 25 countries participated in a two – day country promotional exhibition featuring their culture, touristic attractions, fashion, people, food & hospitality etc, which attracted visitors in thousands. The countries participated included Asian, African, European and Western nations, which all had maintained promotional booths at the Kuwait University Auditorium represented by their respective embassies based in Kuwait. The exhibition was inaugurated by the Minister of Education and Higher Education, Prof. Moudhi Abdul Aziz Humoud. Dr. Massouma Al Mubarak, Member of Parliament, Prof. Abdul Reda Assiri, Dean of the College of Social Sciences of the University, members of the diplomatic corps, distinguished scholars, country representatives, Kuwaiti and foreign nationals and university students joined the celebrations. The Sri Lankan booth organized by the Sri Lankan Embassy Seva Vanitha Unit attracted large number of visitors. The booth showcased a range of products including tourism literature, handicraft items, ornaments, gems & jewellery, Sri Lanka’s culinary & food, fashion & batik items, tea, gift items etc made of local raw-material. The visitors had the opportunity of tasting a cup of precious Ceylon tea and Sri Lanka’s traditional sweet meals such as kevum, kokis, dodol, Asmee among others. The booth was also decorated with masks, bridal wear, sarees, cottage items, bronze wear, silver wear and some of the best-known brands of Sri Lankan garments and products. The Chief Guest and the Minister of Education & Higher Education, Prof. Moudhi Abdul Aziz Humoud together with Dr. Massouma Al Mubarak, member of the Parliament accompanied by Prof. Abdul Reda Assiri, Dean of the College of Social Sciences of the University visited the Sri Lankan booth and praised the staff for the warm welcome and general hospitality extended. They also admired Sri Lanka’s beauty, diversity, breath taking attractions, heritage, friendly people and items on display. The Minister recalled her memories of Sri Lanka experienced firsthand on her previous visits. Similar sentiments were echoed by Dr.Massouma Al Mubarak, Member of Parliament, who shared her pleasant recollections about Sri Lanka. The Sri Lankan booth was well received by visitors who admired Sri Lanka, its charm and people and the hospitality. 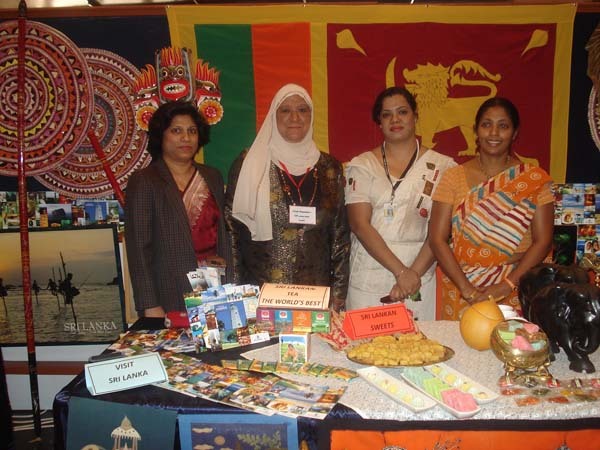 The Sri Lankan booth was elegantly decorated by Mrs. Mumtaz Fareen and Mrs. Apsara Peiris, members of the Embassy Seva Vanitha Unit, joined by its Chairperson, Mrs. Ramanika Dissanayake and the Ambassador of Sri Lanka in Kuwait, Sarath Dissanayake. The excellent arrangements made by the staff on duty enabled them to promote Sri Lanka as a safe and attractive country for travelers as well as a potential destination for investments and trade. The Sri Lankan booth was one of the most attractive country pavilions maintained by the Embassies at the Exhibition.